Wasted time in the workplace is a massive problem. How big is exactly unclear, but from our research, the cost to business is in the millions (if not billions) in lost productivity every year. In this infographic, we break down the impact of wasting time at work. The figures are surprising, if not alarming. It is estimated that businesses lose 40% from non work Internet related surfing. Most of this comes from the widespread use and misuse of social media at work. What makes this harder to control is that 31.2% of workers feel that it is appropriate to surf non-work related sites everyday and 65% even said that they received a benefit from using social media. No wonder why even if social media use is being abused at work, only 15% of businesses have a social media policy. This means a lot of businesses are still losing money year after year. Surfing the web is where most employees (48%) are wasting time at work. On average, workers with an Internet connection spend around 21 hours a week online while in the office. This is followed by socializing with co-workers, conducting personal business, taking personal calls and long lunch breaks. Because Internet usage abuse makes up most of the unproductive time at work, businesses are already responding by doing measures to monitor employees. 45% of employers are tracking content using network level software, 43% also monitor email 43% even store and review computer files. Two thirds of businesses monitor software and roughly half of them actually assign someone to manually read and review emails sent on company time. And to top that, they also block websites at work. Facebook is the most blocked followed by MySpace, YouTube, Doubleclick.net and Twitter. While this may seem too draconian, 70% of employees say that employers have the right to monitor their Internet activity. It may also be a better idea to use an employee monitoring software. It helps eliminate wasted time without being intrusive. It’s not uncommon how emails take up most of our time every day at work. But, checking of personal emails makes the workday more unproductive. More than 70% admit to checking their personal emails at work. 33% of them even check it 3 times a day! Emails are also subject to abuse by the employees. That’s why 28% of employers have already fired workers for either violation of policy and excessive personal use. These include 14% of workers in a survey of 568 companies admitting to emailing confidential information and 6% having used email to transmit confidential customer data. That is alarming. This kind of loss had a tremendous negative impact on businesses. This massive social network deserves a mention on its own. This makes up 7% of the websites accessed at work and is a major contributor to all the wasted time in the workplace. Around 400,000 users sign up every day and 800 billion minutes are spent on this website alone every month. The average user spends 55 minutes per day. This is also why companies should already consider having a social media policy. 20% of them still don’t see the need for it. All these activities make up where your team is wasting time at work. Check out the full infographic below. Are you doing something about it? Let us know in the comments how you have been dealing with all these wasted time in the workplace. Only reaosn I am posting is because I hate time doctor. My boss didnt tell me it was taking screenshots of my computer, and I opened some sensitive info when I was looking for files. Mind you I wasnt on facebook or anything, just looking for files on my pc. BTW I also scanned through the infographic, it seems too detailed. I had a job of 10 hours a day and I remember not to have lunch break even from my employer. This was really pathatic. And, if I took some break, they said, it’s wastage of time, you should arrange food at office. I worked about 10 hours a day too without a lunch break just because of time doctor. Its a modern kind of slavery. The graphic is certainly concentrated with a great deal of information. I’m afraid I may have wasted some time trying to decipher some of the data points, however. For example … the first graphic (pie graph) leaves you wondering about the largest slice of the pie … then you read that only 15% of businesses have a social media policy, but somehow 54% of businesses manage to prohibit Facebook and Twitter without such a policy … then you have to figure out how 21 on-line hours per week equals 1 on-line hour per day … and so forth. The risk of such concentrated graphics is that we become awed by the scope and appearance, but don’t spend enough time stepping back to judge readability, digestibility and accuracy … If one could only have Q&A with an infographic to clear up any confusion. The beauty is not in the art but in the effective communication. My thinking exactly – I’m looking for an informed number on how much time people (with an internet connection) actually spend on non work items. I’ve seen that salary.com surveyed a number of businesses back in 2007 and came up with 2 hours as a number for non productive activity. ps: where is your graphic designer from? Killer graphics dudes! Our graphics designer that did this infographic is from the Philippines. Thanks for the compliment! that was funny John. Great work you guys. I am actually trying to get something like this implemented. Today I found out that my staff has been using facebook, TSN, and sports related websites at work so I blocked them. Do you have any studies where blocking these sites actually deteriorates work productivity? I personally wouldn’t ban those sites. People need to relax and take a break. 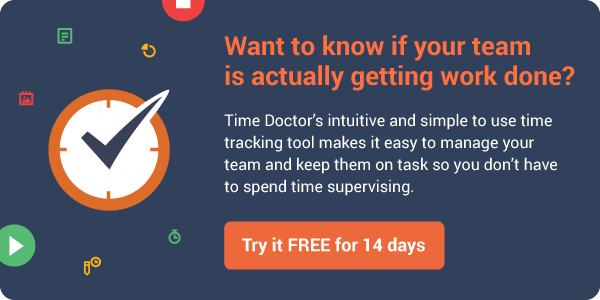 If you’re worried about them staying on task simply install Time Doctor and I promise your team will become more productive. Seems to be working in all the browsers I checked in?